Rated PG-13 for some thematic elements and suggestive content. About 25 years ago I met a fine artist, a painter, on a train trip to visit a mutual friend. We discussed our respective professions/enthusiasms, and she told me that as a rule she hated movies about painters because they were almost uniformly false—to the point of being corny—in their depiction of the act of painting. One exception, she said, was the then-recent “Life Lessons,” the Martin-Scorsese-directed episode of the 1989 “New York Stories,” in which Nick Nolte played an abstract painter. That movie got it, she said. I was glad to hear it, as I enjoyed the movie too, but I also said that as someone who had little clue about how painting was actually accomplished, I could enjoy Vincente Minnelli’s “Lust For Life” regardless. Writers have less of a hard time with movies about writers, because the act of writing is something that’s somewhat pointless to depict visually, so you kind of can’t go wrong. But there’s also a kind of inherent futility in using a visual medium to convey the interior machinations of the creative act. It’s helpful, then, in concocting movies about writers, to choose or create writers who are oversized personalities, men and women who do a lot more than spend time hunched over a desk wrestling with their own thoughts. 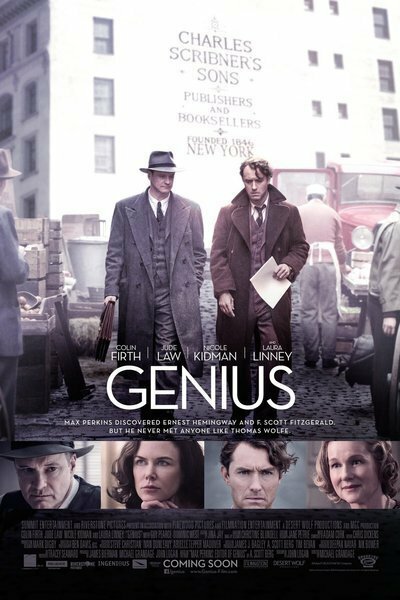 The movie “Genius,” directed by Michael Grandage from a script by John Logan, does not lack for those. The central figure, though, is not a writer but an editor, the real-life Maxwell Perkins, a man whose most pronounced eccentricity, it seems, involved almost never taking his hat off. “Genius” is the story of book man Perkins, friend and collaborator to the likes of Ernest Hemingway and F. Scott Fitzgerald, who play significant roles here, and the way Perkins took on and tamed the fiery poetic work of North-Carolina-born visionary (or blowhard, depending on which literary critic you consult) Thomas Wolfe. If you have any feel for writing, and I suppose if you particularly have any feel for Wolfe’s writing, you’ll find the exchanges between editor and author exhilarating. Logan’s script, based on A. Scott Berg’s biography of Perkins, is invested in the craft of words like few other movies nowadays, even those ostensibly about writers. And if you have no particular concern for writing, the emotional drama is not insignificant. Nicole Kidman plays Aline Bernstein, a married woman who’s Wolfe’s lover and unofficial patron, and her scorn upon seeing her place in Wolfe’s life become supplanted on account of Perkins’ presence commands attention. As for Perkins, Wolfe starts looking like the son he and wife Louise (Laura Linney) very clearly tried for but never had. As success goes to Wolfe’s head, though, Perkins gets inklings that he may have created an ego monster, while Wolfe himself insists that Perkins loosen up and follow him to the places where he finds “the dark rhythms that inspire me.” As for Hemingway (Dominic West) and Fitzgerald (Guy Pearce), they make their concern and/or disapproval known from the sidelines. I’m not the only one who was at least slightly taken aback, though, by a persistent quirk in the movie’s casting, which is that not one of the Lions of American Literature in this picture was played by, well, an American. Firth is British, Law is British, Dominic West is British, Guy Pearce is Australian and so is Nicole Kidman. “What about Zelda Fitzgerald, you sexist?” I can hear somebody saying. Well, yeah. She IS depicted in the movie also. By Vanessa Kirby. A British actor. They all do their jobs pretty splendidly though so I can’t really complain. But I did notice. As well you might, too.